Description: This deciduous tree is 40-100' tall, forming an erect trunk about 1-5' across and a large crown of branches and leaves. Depending on its maturity and location, the crown of this tree is ovoid to broadly oblongoid in outline. Upper to middle branches are ascending, while lower branches are slightly drooping or widely spreading; twigs have a tendency to curve upward toward their tips. 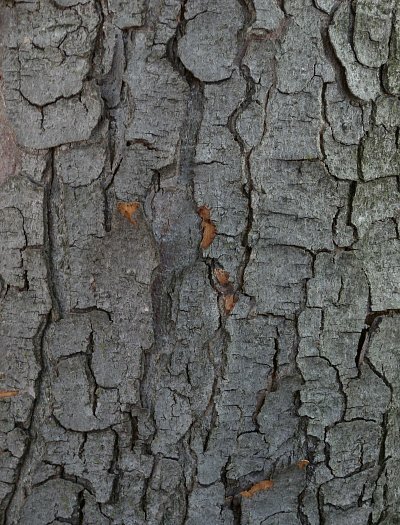 Trunk bark of mature trees is gray, somewhat fissured, and scaly, although not particularly thick. The bark of branches are gray and more smooth, while twigs are light brown and smooth with scattered white lenticels (air pores). Young shoots are light green, terete, and mostly glabrous. Pairs of opposite leaves occur along the twigs and young shoots. These leaves are palmately compound with 5-9 sessile leaflets (typically there are 7 leaflets per leaf). Individual leaflets are 3-8" long and 1-3" across; they are oblanceolate in shape, while their margins are mostly serrated, although they become toothless toward their bases and doubly serrated toward their tips. The tips of leaflets taper abruptly into short narrow tips (acuminate), while their bases are narrowly wedge-shaped (cuneate). The outer lateral leaflets and terminal leaflet are larger in size than the inner lateral leaflets. The leaflets are widely spreading or droop slightly from their bases. The upper leaf surface is yellowish green during the spring, becoming dark green during the summer; it is glabrous. The lower leaf surface is more pale than the upper surface, and usually glabrous, although it sometimes has brownish strips of fuzzy hairs along the central veins of the leaflets. The petioles of the compound leaves are 3-10" long, light green, terete, and glabrous. Panicles of flowers about 6-12" long and 3-6" across occur at the tips of twigs. These panicles are more or less erect and a little wider at their bases than their apices. There are typically 25-50 flowers per panicle. The flowers along the upper half of the panicle are male (staminate), while the flowers along the lower half of the panicle are both male and female (perfect). Each flower is about 1" long and 1" across, consisting of a short-tubular calyx with 5 teeth, 5 spreading white petals, 5-8 strongly exserted stamens, and a pistil with a strongly exserted style. The calyx is light green or yellowish green. The similar-sized petals are oval in shape, rather wrinkly, finely pubescent, and ciliate along their margins. The two upper petals have conspicuous patches of yellow toward their bases that become red as the flowers age. The stamens have white filaments and orange-brown anthers, while the style is white. Both the filaments and style are finely pubescent toward their bases. The central rachis, lateral stalks, and pedicels of each panicle are light green to yellowish green, terete, and sparsely canescent; the pedicels of the flowers are relatively short (usually 1" or less in length). The blooming period occurs during late spring, lasting about 2-3 weeks. The flowers have a sweet honey-like fragrance. Afterwards, perfect flowers are sometimes replaced by seed capsules (usually only 1-3 seed capsules are produced per panicle of flowers). These seed capsules are about 2" across and ovoid-globoid or globoid in shape. The leathery outer husks of these seed capsules are initially light green, becoming brown with age; they are more or less covered in prickles. Each husk contains 1-2 seeds (rarely 3 seeds). These nut-like seeds are ¾–1½" across and globoid or subgloboid in shape; they are dark brown and smooth, except for 'eyes.' The latter are tan and slightly rough-textured. At maturity, these seed capsules fall to the ground and their husks divide into 3 segments, releasing the seeds. The woody root system produces a deep taproot and more shallow lateral roots. This tree reproduces by reseeding itself. Cultivation: The preference is full or partial sun, moist to dry-mesic conditions, and soil containing clay-loam, silt-loam, or loam. Because the large seeds lose their viability quickly, they should be planted in the ground or in a deep pot shortly after they are produced during the autumn. This trees develops fairly quickly, and it is able to produce flowers and seeds after about 20 years. Longevity of healthy trees is typically about 100 years. Winter hardiness is excellent (to Zone 3). Sometimes the leaves are affected by disease organisms, but this is rarely a severe problem. Range & Habitat: The non-native Horse Chestnut is uncommon in Illinois (see Distribution Map). Although it is occasionally cultivated as a landscape tree in parks and yards, this tree does not escape from cultivation very often. Horse Chestnut is native to SE Europe. Habitats of escaped trees include disturbed open woodlands, roadsides, edges of yards, parkland, vacant lots, and waste areas. Areas with a history of disturbance are preferred. So far, this tree has not become invasive in Illinois. In the United States, isolated naturalized populations occur primarily in the Northeast and Midwest. Faunal Associations: Robertson (1929) observed the Ruby-throated Hummingbird, bumblebees, and other long-tongued bees (Anthophora, Synhalonia) visiting the flowers for nectar. Some insects feed destructively on Horse Chestnut. For example, two highly polyphagous insects, adults of the Japanese Beetle (Popillia japonica) and larvae of the White-marked Tussock Moth (Orgyia leucostigma), feed on the leaves of this tree, while the larvae of the Maple Twig Borer Moth (Proteoteras aesculana) bore into its young shoots and petioles (Cranshaw, 2004; Miller, 1987). Several armored scale insects are sometimes found on the bark, including the San Jose Scale (Diaspidiotus perniciosus), False San Jose Scale (Diaspidiotus ostreaeformis), Oystershell Scale (Lepidosaphes ulmi), and White Peach Scale (Pseudaulacaspis pentagona). All of these scale insects are polyphagous (ScaleNet, 2014). 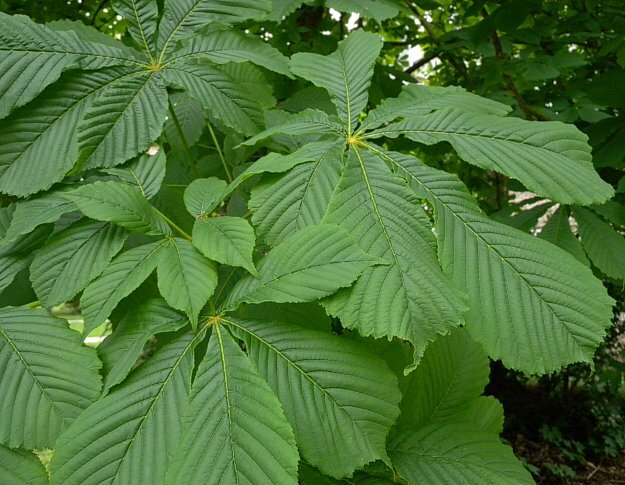 The foliage, bark, and seeds of the Horse Chestnut are toxic because they contain saponins and a coumarin glycoside, Aesculin. As a result, they are rarely consumed by mammalian herbivores. Photographic Location: A yard in Urbana, Illinois. Comments: This tree can become quite large in size. It has attractive and fragrant flowers. In Illinois, Horse Chestnut (Aesculus hippocastanum) can be distinguished from native Aesculus spp. (Buckeyes) by the shape of its leaflets: they are widest toward their tips (oblanceolate in shape), whereas the leaflets of native species are widest toward the middle (elliptic in shape). 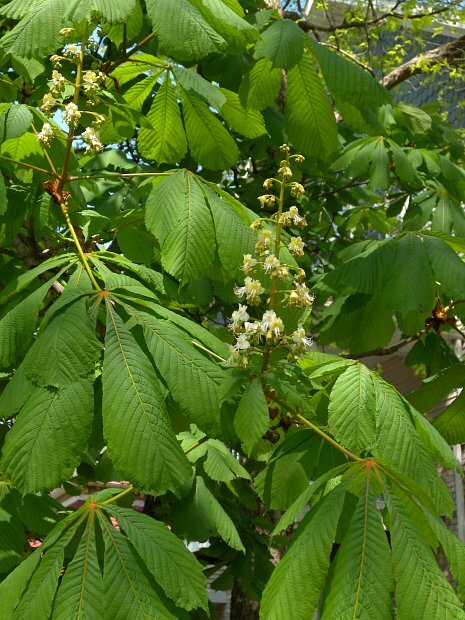 Horse Chestnut has been hybridized with the native Red Buckeye (Aesculus pavia). 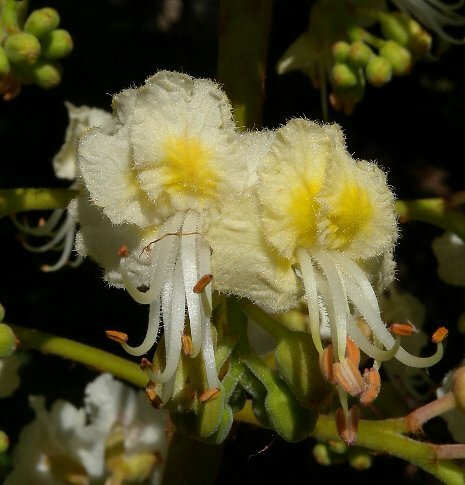 This hybrid resembles the Horse Chestnut, but its flowers are predominately pink, rather than white. Buckeye trees and the Horse Chestnut have been reassigned to the Soapberry family (Sapindaceae) recently as a result of genetic analysis. The wood of Horse Chestnut is light-colored, fine-grained, and soft. It is rarely used for commercial purposes. 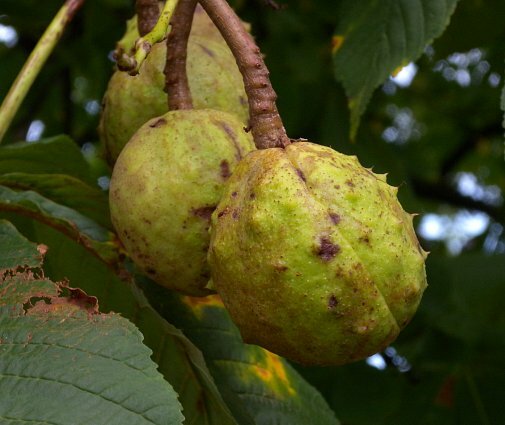 In spite of its common name, this tree is not closely related to chestnut trees (Castanea spp. ).